HOW DO WE GROW OUR OYSTERS? We are one of a handful of farms on the east coast with a hatchery. This gives us control of our whole process from start to finish. Our hatchery allows us to start with oyster seeds, decide which oysters make it to the bay for growth, and ultimately harvesting. This careful process gives us the opportunity to work with some of the finest chefs in the country in selecting what goes on their menus and what oysters make it to your table. 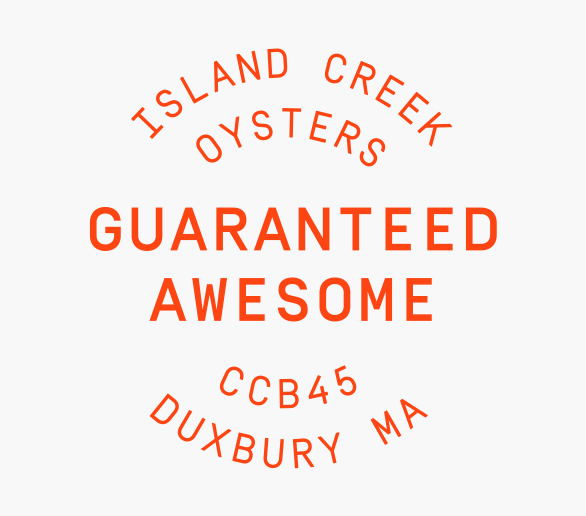 Timing is everything these days, so we grow and harvest year round at Island Creek, making them available for retail, restaurants and delivered fresh to your door daily. The hatchery is where we make oyster babies. It resembles any other livestock rearing here in New England–think spring lambs or chicks–where we need to breed the babies and keep them warm, sheltered, and fed through the late winter and early spring so they can get right to growing once they are put out in May or June. Because of this, it is the most resource intensive phase of oyster production. 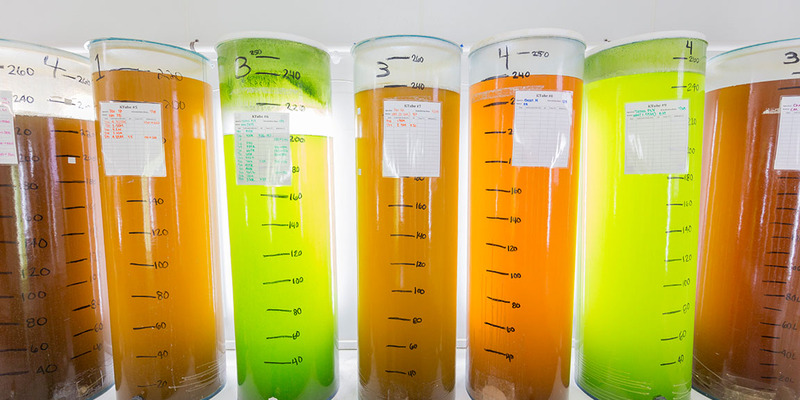 We have to heat the water and grow LOTS of algae to feed the little buggers. All year we collect the “handsome devils” from out on the farm–adult oysters that exhibit desirable traits such as shell shape, meat content, growth rate, and disease resistance–and we bring them inside in January to ripen. Once they spawn we capture hundreds of millions of free swimming larvae that soon metamorphose into a microscopic oyster with a shell. We hold them indoors until they are moved out into the upwelled at about the size of a flake of ground pepper. At that size, one handful of 800,000 oysters weighs about two pounds. 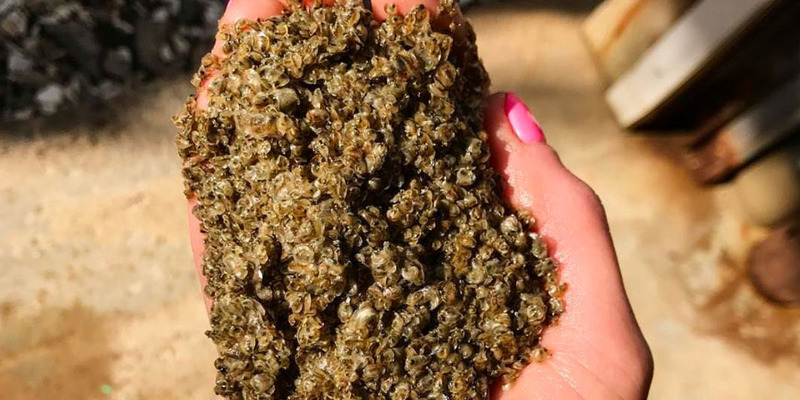 Eighteen months from now that two pound handful will take up about two acres of Duxbury Bay and weigh nearly 200,000 lbs. Pepper-flake-sized oysters are put into FLUPSY’s (floating-upweller-systems) under our docks in May and June. At this point, they are officially input free! No feed, no fertilizer, no pesticides, no nothing (other than elbow grease and sleepless nights). They are growing on pure unadulterated Duxbury Bay salt water and the algae that floats in it. They are still tiny, though, so we use the FLUPSY to protect them from the elements and ensure they have a constant source of food by pumping water through the screen that they sit on 24 hrs a day. At about the a quarter inch or the size of an average pinky nail, we transfer the seed into mesh bags and deploy them further out into the Bay. Here at Island Creek we have the benefit of a floating nursery. We stick the bags into cages that have two big pontoon floats on them. Each cage houses four big bags of seed or up to 2000 oysters. The oysters really do well floating on the surface because the algae they love to eat grows densest closest to the sun and the quick current is a highly effective food conveyor belt (no hunting or gathering necessary for our footless friends… the tide delivers the groceries). Once the oysters reach about a half inch in size–usually in July or August–we either plant them on the bottom or put them loose into trays. Broadcasting them is great because it creates a rugged shell and complex flavor, but results in lower yields. Tray grown oysters such as the Row 34’s and Aunt Dotties have a more delicate taste and appearance reflecting their protected upbringing. We get a higher yield out of these trays but because Duxbury Bay often ices over in winter, we have to pull the trays and the oysters out and hold them in a root cellar from January until March when the threat of ice has passed. After a year or more of life on the bottom or in a growout tray, its time to harvest. 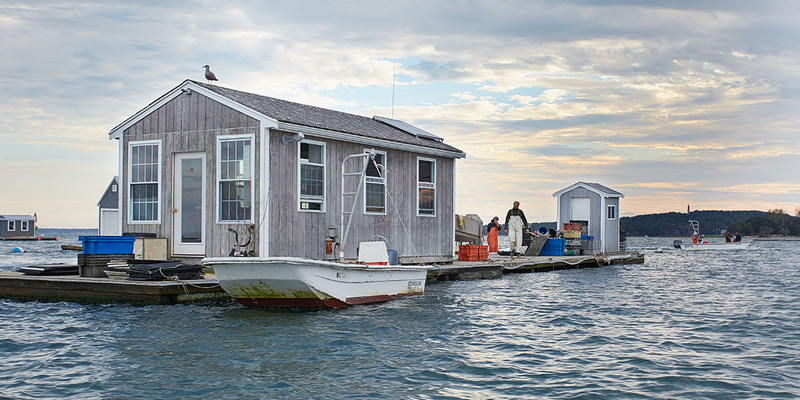 The farm crew goes out at low tide to pick oysters off the flats or out of trays. At high tide we drag a basket dredge to harvest the bottom-planted crop. 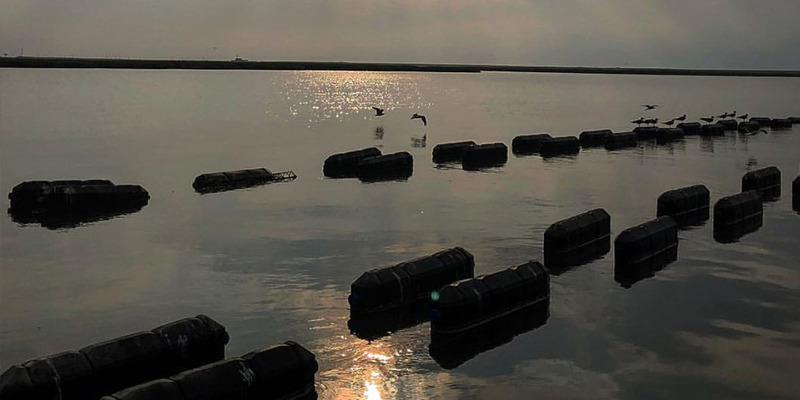 We then take the catch back to our floating farm HQ–The Oysterplex–to cull each one by hand, sort them into different sizes or “culls”, and count them 100 oysters at a time into bags ready for market. Oysters are iced in a slurry within one hour of harvest to ensure quality and food safety. Its a hustle but it makes a difference! They come off the water, into one of our refrigerators, and are whisked off around the country on one of our trucks, by FedEx, or in the belly of a plane. Bam! There ya have it, folks. 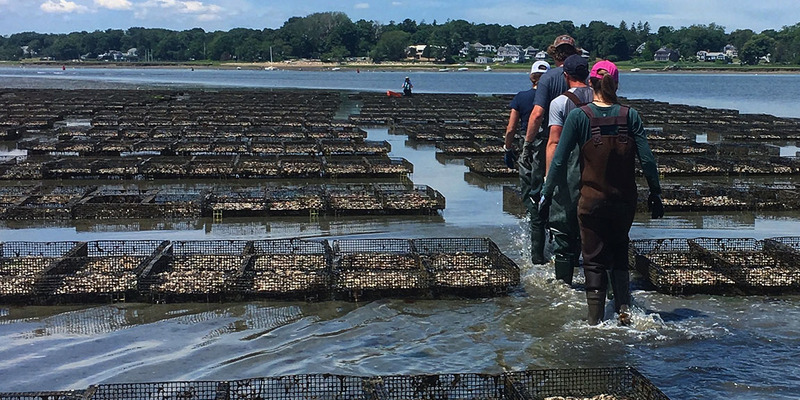 Oyster farming in five easy steps.